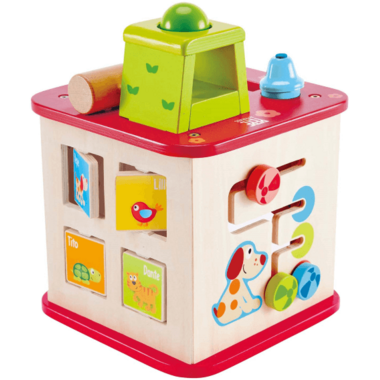 Pepe & Friends Activity Cube features five different play surfaces, ranging from a ball maze, to shape puzzles, gear explorations, colourful mazes, and more. Overall pretty happy with this product. 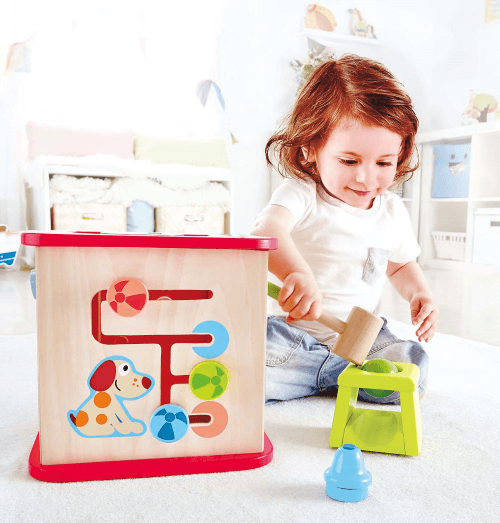 My 12 month old loves pushing the ball through the hole at the top, and just recently learned to use the hammer to actually tap the ball through the hole. 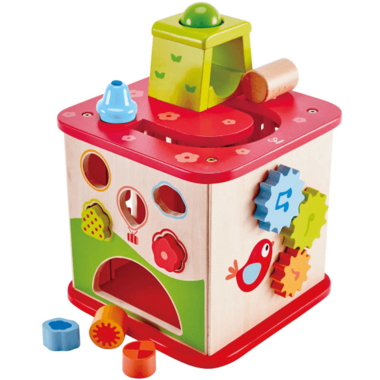 That's probably the most fun activity on this cube, he doesn't care much for the shape sorter or the gears. The only thing I would say as a negative is the fact that the green and blue pieces that sit on top of the cube are not fixed in place. My son was knocking them off all the time and they were getting lost, so I ended up hot-glueing them on to the top of the cube where they belong, so they wouldn't keep falling off.